“As of January 1, 2015, the film has received over 100 million views and nearly 1.4 million “likes” on the video-sharing website YouTube, and over 21.9 thousand “likes” on Vimeo, with other views on a central “Kony 2012″ website operated by Invisible Children.… A poll suggested that more than half of young adult Americans heard about Kony 2012 in the days following the video’s release.” (Don’t worry academics, I’ve also included the more reputable sources below). However, Wikipedia goes on to state that “It was included among the top international events of 2012 by PBS and called the most viral video ever by TIME.” Clearly this type of virility does not happen very often. 2) Even if someone discovers a social cause and then reshares it, the average user holds very little online Klout. Taking this further, even the most popular online profiles usually generate very little resharing, much less donations. Furthermore, getting someone to donate is far more difficult that simply visiting a website or clicking on a tweet. 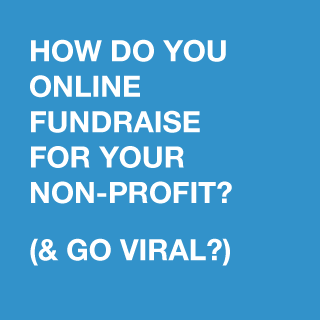 So what is important for online fundraising (and maybe going viral)? While people respond much more positively in person, if you can only fundraise online, it appears very important to have engaging content with rich information that resounds with your target. And even if you do focus with online information, convincing a critical mass of people (for example, gaining the support of a church) might be a necessary method to kickstart your campaign. What do people want to know (and in what medium)? Once you attract someone’s attention online, how can you encourage a reshare? What is the ($) impact of a share? I want to fundraise online – what do I do?! What does it take to reach someone and convince them to donate? I quickly surveyed 21 of my peers and asked them several questions on how they decided (or would decide) whether or not to donate to a non-profit cause. 100% of the 21 recipients voted that they would respond to a friend that discussed the cause with them in real life. This isn’t a surprise – in person discussion with a trusted peer is always very effective. In contrast, 43%, or 9 of the recipients would listen to a friend from social media. People are open to listening to friends, though an online median is a little less than half as effective as an in person discussion. In contrast, only 2 or 10% of recipients would be receptive to finding out a social cause through strangers. 1 person (5%) said a cause on the news could sway them and 1 person (5) said a solicitor could sway them. 0 (0%) people said that that a famous stranger that supports a cause and shared it on Facebook/Twitter/Social Media would have any impact on their decision. When asked to vote on the primary source or method to find and donate to a non-profit, 76% of recipients named other people they knew (33% named friends, 38% named inspiration from a religious organization, and 5% named family). 19% were motivated enough to find a cause themselves. 5% mentioned that solicitation was the most effective method. 0% people mentioned that Social Media was the most effective way to find a cause and gain support for a donation. What do people want to know to make their decision to donate? Out of the 3 questions (1) who is being impacted (2) knowing the location of the cause and (3) knowing how exactly the $$ will be spent, people cared primarily about #1 and #3. 2: What do people want to know (and in what medium)? The 19% of people that wanted to know the location of the cause also wanted to know about factors #1 and #3 (who was being impacted and knowing how exactly the $$ will be spent). People also voted that their favorite method to find this information was via video. 62% voted in favor of video, compared to 19% text and 19% pictures. Personally, when I visited a non-profit fundraiser several weeks ago, it was the video that engaged me most. The rest of the information that I wanted to know (such as finding out how exactly $$ would be spent) was answered in text. 3: Once you attract someone’s attention online, how can you encourage a reshare? While this follow-up survey is a statistically unsound sample-size, a truly viral cause would need to BOTH (1) capture someones attention and then (2) be compelling enough to reshare. As a norm, social media seems to be an effective method to find out about a non-profit cause (0% of 21 people said it was an effective way to find out about a cause). Further, once someone knows about a cause, 60% of people have ever sharing non-profit causes on social media. If we substitute social media impact to 10% (based on the impact of stranger’s influence via News or Solicitation), then this is still a 6% reshare rate (10% discovery via social media X 60% reshare rate) from the original post. It seems that on average, non-profit causes naturally do not go viral. 4: What is the impact of a share? At a 6% estimated reshare rate originally putting content on a social-media outlet, the average user simply may not have enough online Klout to make a huge significance. According to some online resources, the average Twitter user has 208 followers. The average CTR is 1.64%, so if 1 individual shares it, this will generate 5 clicks and at 6% reshare rate, this would die right after. A look at top followed Twitter profiles shows that even the top Twitter followers cannot individually create a movement. Beyond Justin Beiber’s mysterious and magical ability to generate an average of 50K reshares per tweet, the other top 9 Twitter accounts generates an average of 4.7K shares per tweet out of their average of 51.3MM followers. This is a reshare rate of approximately 0.02% from their millions of followers. Based on a 0.11% Mashable CTR quoted in this Twitter study, the top 10 most popular Twitter accounts in the world will generate an average of 56K views per tweet. The average Twitter user will generate a 1.64% CTR. With 208 followers, the average user will generate around 3 views per tweet. And how much $ will be made from each of these tweets? I look at Amazon’s Affiliate program as a proxy to backtrack the potential $$ of donations because Amazon give a standard % cut on referral traffic that results on an Amazon sale. This effective affiliate blogger generates $5 of affiliate fees from 1000 impressions With Amazon’s average 6.25% associate cut, it’s likely that affiliate marketing blogs send around $80 sales to Amazon per 1000 impressions. At this rate, the average donation directly generated from a TOP 10 TWITTER ACCOUNT TWEET who has MILLIONS of followers is an average of $4.1K to $4.5K. Even the Rock, who has a massive following of 8.3 MILLION followers may only inspire $730 dollars per Tweet. (The Rock only generates around 516 reshares per tweet). At these rates (1.64% average click through with 208 followers and the ability to inspire $80/1000 impressions), the average user will inspire $0. See the Twitter user analysis here. With a plethora of existing online fundraising platforms, you would be kind of foolish not to leverage online fundraising platforms. Imagine talking to someone in person and then asking them to write a check (instead of say, leveraging Stripe or Paypal) or not being able to give them a website where they can follow-up and find out more information. You should fund-raise online as part of your strategy, but know that people may respond much better via in person. The absolute most important way to gather people’s interest is if you are able to convince a core of people to support the cause. When someone truly supports a cause, they will donate it AND reshare it with their friends. And as people have stated, people are much more likely to listen to a friend (100% say they will listen to someone in person and 43% say they will listen to a friend online) compared to the 10% that would listen to strangers. Focus on good content (go video) with information about the cause, the people, and how $$ will be spent and have a good non-profit cause! (The location may not be something that you want to advertise front and center). It would be sweet exposure to get a massive celebrity to kick-start your tweet, but there is no guarantee of virality, and as people stated in the survey, 0% of recipients were keen to listen to a random celebrity talk about something on social media. While the average user will likely generate 3 views per Tweet and inspire $0 of donations (and 40% state they don’t like sharing non-profit causes on social media), I’ll bet anyone who truly wants to support a non-profit cause will. Nelson, Sara C. (March 7, 2012). “Kony 2012: Invisible Children Documentary Sheds Light On Uganda Conflict”.Huffington Post. Antonia Kanczula (April 20, 2012). “Kony 2012 in numbers”. The Guardian. Retrieved April 20, 2012.